"I'm out here still updating and like, you have to interact with these updates," Earl Sweatshirt says. 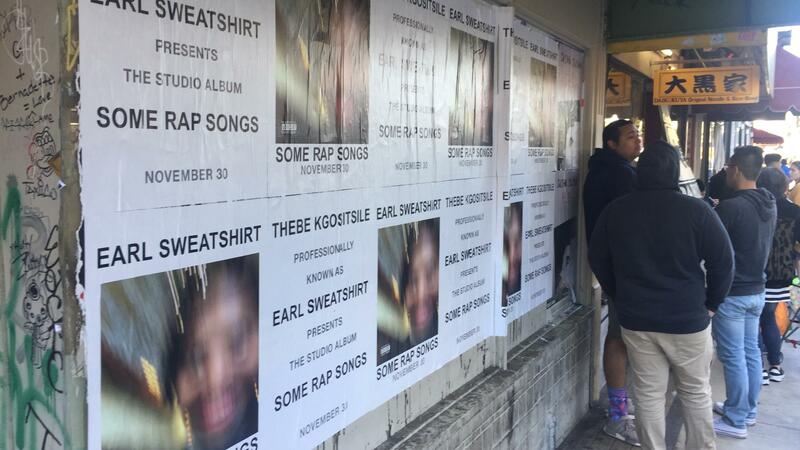 Promotional posters for Earl Sweatshirt's Some Rap Songs in downtown LA. 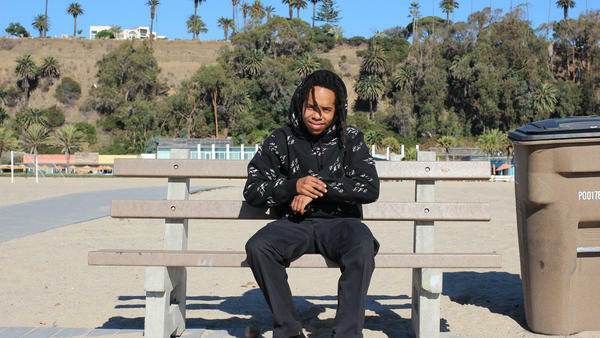 Thebe Kgositsile, known as Earl Sweatshirt, and NPR's Ari Shapiro speak on the beach in Santa Monica. "My favorite part about this s*** is my whole name, and then differentiating Earl Sweatshirt as a PKA," the artist says. "Because this [album] is the most involved fusion dance between my actual self and just this other thing." Earl, born Thebe Kgositsile, has spent years being a topic of hip-hop discussion. First, he was the MySpace Music diamond in the rough and the lyrical miracle of Odd Future who got plucked from his crew and sent away to boarding school in Samoa as a teenager. Then, he was the polymath the who marked his triumphant return with two gritty, critically-acclaimed albums — 2013's Doris and 2015's I Don't Like S***, I Don't Go Outside: An Album by Earl Sweatshirt. And more recently, he's become a recluse, only popping up in production credits or on festival stages every so often. But all the while, the 24-year-old has felt more hailed and commodified than actually understood. Like the promo poster implies, Some Rap Songs is a fusion of a few different things. It's the soundtrack to his grief, as this is his first album to be released in the wake of the death of his father, South African poet laureate Keorapetse Kgositsile, this past January. And at 15 songs, each less than three minutes long, it's a study in scaled-back simplicity, a departure from what fans have come to expect from him. "N****s be victims of overwriting, bro. You can hear when it switches from the heart to the head," Earl says. Beachside in Santa Monica, Calif., Earl spoke with NPR's Ari Shapiro about memorializing his father, working through anger and giving himself a chance to experiment. Hear the radio version of their conversation at the audio link, and read on for more that didn't make the broadcast. Ari Shapiro: What does the fusion of Thebe and Earl sound like on Some Rap Songs? Can you point me to a specific track? Earl Sweatshirt: I'll point you to a track on the album that really is a point of vulnerability. ... I'll give you two. So, "Cold Summers" and "Eclipse." "Eclipse" is a f****** song, man. I was just talking to my friend and DJ about this the other day. I was like, "Bro, I don't know if I'm gonna perform "Eclipse," 'cause it's so... It is so much for me, and like for the niche people that can like catch the bop of "Eclipse." Because there is nothing that tells a large group of people like what to do with their neck on that song. It's very... It's just advanced me. It's just very in a chamber that is not... It's like a language that's not trying to talk to necessarily everybody. Did you decide, going into this album, that you were going to make something that sounded like a fusion between Thebe and Earl? As the Earl that they expect you to be. Which is so wild. Based on who I'm standing in front of, that is such a wildly different person. Not having my identity stamped out for myself early on really had me like on some tofu s***, like just taking on the flavor of whatever. And that s**** is really dangerous, that s*** is very dangerous. So you're saying that after years of that, now you're finally sort of coming into your own and not just conforming to whatever the people around you expect you to be? Yeah, and just giving myself a chance. Like, giving myself time and space and legitimacy to do things like "Cold Summers" or like "Eclipse," just things that are kind of more selfish. You initially became famous for being an acrobatic lyricist. And on this album, sometimes it's hard to even make out what the lyrics are, and it doesn't sound like you're trying to perform or impress. Oh, yeah. Maybe I'll get back into it, like the goddamn lyrical gymnastics, but I think, in part, getting so much attention for doing specifically that made me force myself to learn how to rap, which is a totally different thing from writing. ... You can write by yourself. Rapping is oral, like there's a whole 'nother thing that, it's a whole 'nother advent. Pitchfork said that this album "blurs the line between avant-garde jazz and hip-hop," which doesn't sound like a description of an album that would be called Some Rap Songs. I mean, then you gotta look at really like what is rap. That s*** is black expression, bro. And what was jazz? The one that got copied, the one that got over-produced, over-criticized, over-made a victim of like nomenclature. It's black expression, bro. Are you trying to expand the definition of rap? No, I'm going back to what it is. Look at what it is like from the documentaries. I think, when I was getting into rap music, my mom made me read the Jeff Chang book [Can't Stop Won't Stop], my mom made me watch all the rap documentaries. It's like, bro, somebody gotta watch that s***. I be thinking that things are matter of fact, like for all of us. Like, the definition of this means this, but it's like, that's where you get into when consensus realities are different. Because if I'm like, "This comes from black expression," black expression is directly related to pain — at least this black expression is. And then if you want to compare it to jazz, when it started getting avant-garde, when it started getting whatever, n***** was wailing. N***** using these instruments to express very crazy emotions, like that come as a result of the sometimes cursed existence. So, like, that's what's tongue-in-cheek kind of about rap. You're not expanding the definition, you're reminding us of what it's always been. That people have forgotten. Yea, man. Exactly. I feel like there's this really subconscious push away from... I mean, we're like three years into this presidency, so I don't know if people still want to do things like categorize this time as like post-racial or whatever, but we're in this time where things are moving forward really quickly, like the next generation is coming. I don't even mean like musically, I mean the generation. And a lot of things, culturally, can disappear with forward motion without concerted efforts. You had planned to reunite with your father, who you had not seen for years, and then he died very suddenly. And one of the tracks on this album samples his voice and your mother's voice. Will you tell us about it? It's called "Playing Possum" and it got made and everything before my dad died, which I'm still figuring out that code, that like playing possums code. So, like making that song, calling it "Playing Possum," and then my dad dying. Playing possum means playing dead. Possums, I know this from my dog when I was younger, who used to kill 'em, they play dead. They'll sit there and fully act like they're dead and then slink off. That song is way less about my dad dying than it is about what both of [my parents] were talking about, and the conversation I was trying to have them in with each other. Just like them back and forth. It's crazy. ... It's excerpts from my mom's keynote speech that gives. It's this really beautiful opening that she did. And then from my dad's poem "Anguish Longer Than Sorrow," where the last line of that poem is — and I'd say kind of the thesis is — he said, "Let me borrow the rememberer's voice while I can and say: to have a home is not a favor." Which just like, for me and people that are in my life, there's word association with that, and emotion association with that, that's just like...scratches a good itch. A couple weeks after your father died, his best friend, legendary trumpeter Hugh Masekela — who was like an uncle to you — also died. Is that his trumpet that we hear on the track "Riot!"? That's a Hugh Masekela song. Go listen to that song. It's called "Riot!." That's just a little ode. It's a rearrangement. My man Gio [Escobar] really like sat in the captain's chair on that. Gio, from Standing On The Corner, executed that vision really nicely. These losses are now coming up on one year ago. How are you feeling about the journey you've traveled in that year? F***, man. It's been so much. I think I'm still resentful. That, this weird set of experiences is happening to me. I know I shouldn't be, but ... I know that this is a step, in a series of steps, towards not being kind of in this place. 'Cause I'm just tired, bro. Do you feel like you're carrying on his legacy, as a rapper the son of a poet? [Laughs] Sounds like a no. No, not even that. ... I mean, only so much of it can come from being born, right? 'Cause I feel like that takes away from the f****** work that both of them put in — the energy, the time, that just went into making words what they were to me. And that just don't happen from being born. I think what kind of churns my stomach about it is, this man, when he was 21 years old, got exiled [from South Africa.] Like it was different. Like different things. When I was 21, I was at SXSW, you know what I'm saying? Different lifestyles, bro. The press release for this album calls you a surviving child star. It made me wonder what you feel you survived. Surviving child star meaning ... I'm out here still updating and like, you have to interact with these updates, you know what I mean? And that's why I get so like worked up and anxious. That's why over those three years, I was freaking out, because it's on me as the child star to give you these updates. I'm this age now. ... Or else you can get trapped in people's minds as 18 years old, as whatever age you are as a child star. A lot of people describe this music as an evolution from the anger of your early work. I wonder, if it's an evolution from anger, what would you say it's an evolution to? My cousin said this when I played her the stuff like a year ago. She just immediately was like, "Wow, you're less angry." Less angry. Directed anger, you know what I mean? I don't know. I've had a really crazy experience with anger this year, because it's something that I've looked back at, I've looked back at some interviews I did. I said that I say crazy s*** in songs because I don't yell in real life. And then with the frustration, bro, of losing my pops, and then resentment. I've been angry. There's been moments this year where I've been, like, mad. That mad that can only come from feeling like existentially wronged, you know what I'm saying? Does having it out there allow the anger to kind of dissipate into the universe? To put it out in the world and be able to let go of it? I'm so excited for me to find out more about this [music] just like everyone else, man. 'Cause that's where I'm at with it now. And then I don't want to limit where I can be at with it, or what I can find out about it. 'Cause I feel like narrowing it down, that doesn't feel right, to narrow it down to anger. It's not, in the traditional sense, there's not like angry elements. Well, I mean, how are we defining anger? Because I think, the music that I'm thinking about that I would make when I'm angry would be kind of like spiteful, and I feel like Some Rap Songs is the total opposite of that. Right, the music doesn't feel aggressive. No, it's very... it's calm. Especially now, everything just always feels like Mr. Krabs meme, everything's always just moving really fast. I feel like that [calmness] is mad effective, and is necessary. It's like that person that when you're the most wound up, just refuses to go to that level with you, that's just like, "I'm gonna keep talking at this level right here until you get tired. And you're gonna get tired, and then we can talk at this level." And that's what I feel like my whole s*** is. Web intern Kristy Guilbault and web editor Sidney Madden contributed to the digital version of this story. Here in LA, there are a bunch of posters plastered downtown - a blurry face on a white background with bold black text. EARL SWEATSHIRT: It says, Thebe Kgositsile, professionally known as Earl Sweatshirt, presents the studio album "Some Rap Songs." EARL SWEATSHIRT: This makes me so happy. SHAPIRO: Thebe Kgositsile, aka Earl Sweatshirt, hadn't seen these posters until I showed him a photo as we sat by the beach. He told me he loves that the posters have his birth name and his stage name. The play between those identities Earl and Thebe is a key part of this album "Some Rap Songs." EARL SWEATSHIRT: (Rapping) Bend, we don't break. We not the bank. We all we got. Switch whips, relocate way out of state. This is the most involved fusion that is between my actual self and this, like, other thing. SHAPIRO: The persona Earl Sweatshirt carries baggage. He became famous eight years ago at the age of 16 with music and videos that were deliberately shocking and violent. And we should mention that there's language in our conversation that might offend some listeners. EARL SWEATSHIRT: Earl Sweatshirt is a loaded phrase. Like, if you write a article about me right now, you have to do the obligatory first paragraph about Samoa. You have to do the thing. EARL SWEATSHIRT: It comes with something. Earl Sweatshirt comes with something. SHAPIRO: So that obligatory paragraph about Samoa - just as Earl started to get famous, he disappeared. His fans turned Free Earl into a meme. Turns out his mother had sent him to the South Pacific to attend a school in Samoa for at-risk boys. He says the experience helped him grow up and cemented his love for the ocean. EARL SWEATSHIRT: Yeah, we are at the beach. We're looking at the beautiful California coastline, baby. SHAPIRO: At this beach club, he looked relaxed in a black hoodie. And this album feels relaxed. There's less of the acrobatic wordplay that made him famous. These are the first sounds we hear. EARL SWEATSHIRT: Yeah, chief, get it 'cause we mean it. SHAPIRO: I asked Earl - Thebe - about the album title "Some Rap Songs." EARL SWEATSHIRT: ...'Cause it is what it is - swear to God that's some rap songs right there. EARL SWEATSHIRT: (Rapping) We back, yeah. You dig? SHAPIRO: It's funny 'cause Pitchfork said that this album blurs the line between avant garde, jazz and hip-hop, which doesn't sound like a description of an album that would be called "Some Rap Songs." EARL SWEATSHIRT: I mean, well, then you got to look at really, like, what is rap - black expression, bro. And what was jazz? It's black expression, bro. EARL SWEATSHIRT: (Rapping) I couldn't find a friend, had to rely on my wits. I be with MIKE and Med. Nowadays I be with Sage and with Sixpress. EARL SWEATSHIRT: No. I'm trying to get - I'm going back to what it is. Black expression is directly related to pain. At least this black expression is. And then if you want to compare it to jazz when it started getting avant garde, niggas was wailing, niggas using these instruments to express very crazy emotions that come as a result of these sometimes cursed existences. SHAPIRO: You come from a lineage of wordsmiths. Your parents work with words. Your mother is a UCLA law professor, and your father was the poet laureate of South Africa. You had planned to reunite with your father, who you had not seen for years. And then he died very suddenly. And one of the tracks on this album samples his voice and your mother's voice. It's called "Playing Possum." CHERYL HARRIS: To my mentors and comrades in arms, those presence and those gone on, thank you to my family. KEORAPETSE KGOSITSILE: Can you see them now? HARRIS: Who have let me be distracted and inconsistent in my attention. KGOSITSILE: ...The premature daily death of their dreams. SHAPIRO: One of the things that strikes me about the voices of your two parents is that your mother, if I interpret this right, seems to be talking about family in a very immediate, literal sense, and your father seems to be talking about family in a much more global, human sense. EARL SWEATSHIRT: Yeah, that's them, bro. SHAPIRO: That's who they are. EARL SWEATSHIRT: That's them. My mom cares about the global human family but has made it very clear that she cares about her family family before that, where my dad - his commitment - you see it. Well, his commitment to people - and it was an unapologetic one. There's parts, though, where my dad at the beginning just, like, takes some [expletive] my mom says and just real - in just one fell swoop just decentralizes the West as the center of that statement. HARRIS: ...My whole family network. HARRIS: You know the real deal. KGOSITSILE: ...To have a home is not a favor. SHAPIRO: To have a home is not a favor. EARL SWEATSHIRT: Which just, like, scratches a good itch. SHAPIRO: Do you feel like you're carrying on his legacy, I mean, as a rapper, the son of a poet? SHAPIRO: (Laughter) That sounds like a no. SHAPIRO: He left South Africa for the United States. EARL SWEATSHIRT: ...Different. When I was 21, I was at South by Southwest. You know what I'm saying? EARL SWEATSHIRT: Different lifestyles, bro. EARL SWEATSHIRT: (Rapping) Know I'm on the way. Family saw you on that stage, left it not amazed. SHAPIRO: This loss is now coming up on one year ago. And how are you feeling about the journey you've traveled in that year? EARL SWEATSHIRT: [Expletive] Man, it's been so much, the frustration - right? - of losing my pops. EARL SWEATSHIRT: (Rapping) Picking out his grave, couldn't help but feel out of place. Try and catch some rays. Death - it has the sour taste. I think I'm still resentful. EARL SWEATSHIRT: That, like, this weird set of experiences is happening to me. I know I shouldn't be, but I - like, not shouldn't be, but I know that this is a step in a series of steps towards, like, not being in this place. EARL SWEATSHIRT: (Rapping) Dark face on the news, clouds gray on the move, on the way like the truth. SHAPIRO: Thebe Kgositsile, the rapper Earl Sweatshirt - his new album is "Some Rap Songs." Transcript provided by NPR, Copyright NPR.